This limited edition Astro Boy Ultra Box Set 2 contains episodes 53-104, plus a DVD full of extra bonus material, including Japanese episode #193 - the final episode, never before seen in the US! - and a collector's booklet featuring "The Cinema of Osamu Tezuka," Original Astro Boy Advertisements, Line Art, an Episode Guide, and more. The very first anime ever produced, Osamu Tezuka's original Astro Boy delighted children around the world with its touching stories and compelling characters. In the U.S., many will remember this popular children's series with its catchy theme song which aired on TV during the 1960s! 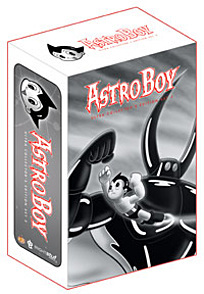 ASTRO BOY returns for the first time ever on DVD! In this stunning second collector's edition, you'll find the final 52 episodes of the original black and white series as seen in the US, restored to pristine detail, and featuring never-before-seen footage and an amazing collection of extras! The original boy-robot with 100,000 horsepower strength and courage! In the year 2000, Dr. Boynton creates a super-robot in his deceased son's image. He calls the robot Astro Boy. Astro Boy can swim oceans, leap over mountains, even fly into space on his own power. However, Astro Boy can't replace his son. Dr. Boynton becomes dissatisfied with the boy robot and disowns him. Astro Boy is befriended by Dr. Packadermus J. Elefun of the Institute of Science, who guides him through his adventures. Endowed with super strength, rocket-powered flight, a selfless heart and a kind demeanor, Astro Boy fights a never-ending crusade against the forces of evil! Special Features: Deleted Scenes, "Behind the Scenes at Mushi Studios" Featurette; Part 2 of an interview with series producer Fred Ladd, Original Japanese Episodes #34, #56, and #193 (English subtitles), Fred Ladd Tour Gallery, Original Character Art Gallery, Merchandise Gallery.